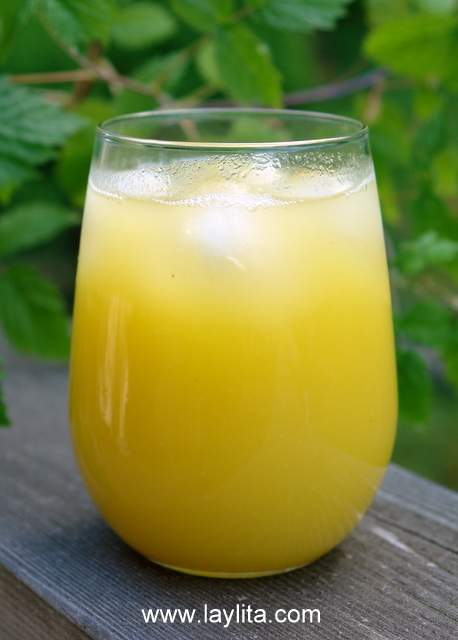 This simple recipe for a refreshing homemade pineapple juice, or jugo de piña, reminds of the freshly made fruit juices that my mom would make for us when we were growing up. 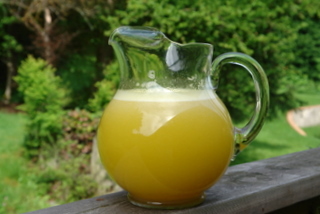 It’s so easy to make and doesn’t compare to store bought juice. You also have complete control over the amount of sugar (or honey or your choice of sweetener), which you can adjust based on the sweetness of the fruit and your personal preference. I highly recommend saving the skins and core of the pineapple to make chicha de piña – a spiced pineapple drink that is also very good. 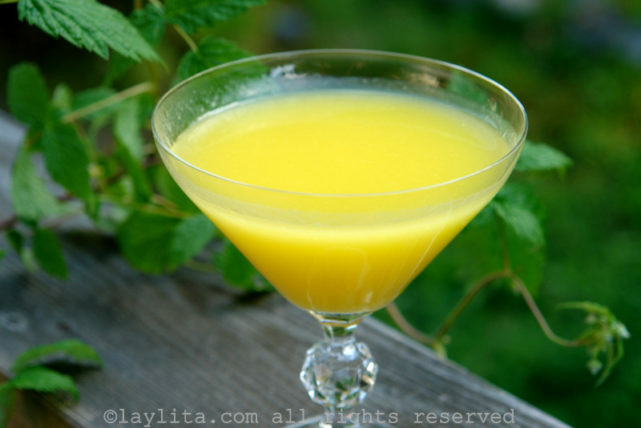 For an adult version of this drink you can add some cachaça (Brazilian sugar cane alcohol), aguardiente (Colombian/Ecuadorian sugar cane alcohol), or some rum. 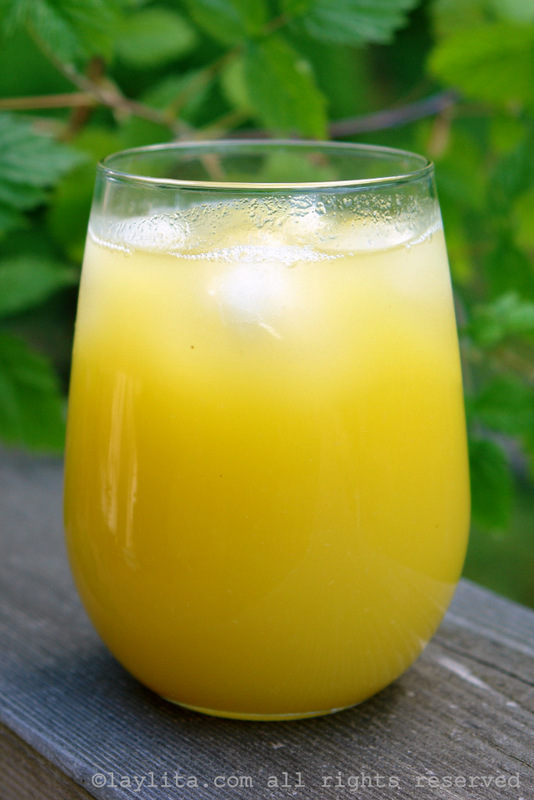 Simple and easy recipe for homemade pineapple juice or jugo de piña made with fresh pineapple, water, sugar/honey, and lime or lemon juice. 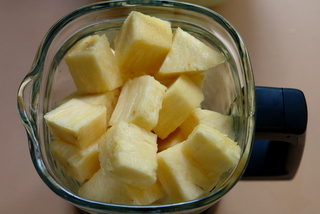 Working in batches place the pineapple chunks with the water, sugar and lime juice in the blender, and blend well. Strain the juice and serve with ice. Remember to save the pineapple skins and core to make chicha de piña. We are finally starting to enjoy some warm spring weather here in the Pacific Northwest (also known to be colder than Siberia in the spring). I love living in the Seattle area, but always have problems with the never ending winter. The winter isn’t extremely cold, just rainy and gloomy, and somehow seems to go into what should be springtime. Just reading about the nice warm weather in other cities was making me insanely jealous. But now, finally there are daffodils, tulips and cherry blossoms everywhere. The kids are more excited about playing outside than about watching TV or playing video games (yay!). Of course, after they are done playing they are thirsty and ready for something refreshing. Which is exactly what they get with this fresh jugo de piña or pineapple juice. How long can this be refrigerated? I just found your site, and love it!!! 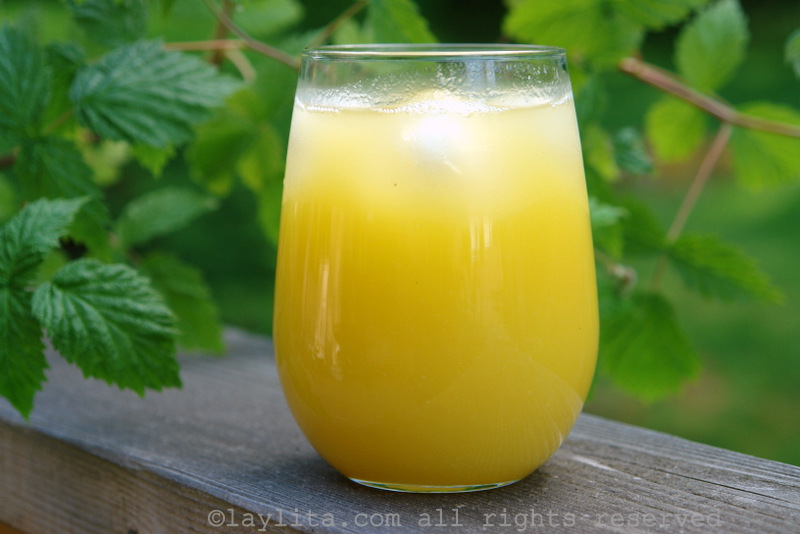 I am a Cdn living in Mexico, and I am going to make this pineapple juice right now!!! I was actually searching google for jugo de piña recipes and yours popped up!!! What do you do with the pulp? I wonder if you can make jam (spiced with cinnamon and clove). Hi Tuty – You could, however there isn´t a whole lot of pulp left over and it´s mainly the very stringy fibery parts. 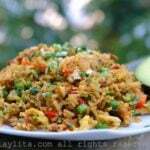 I just discovered your site and have spent a wonderful time browsing through all the recipes. I live in Guayaquil and just bought a cookbook from Supermaxi of typical Ecuadorian dishes. I’m working my way through my favorite recipes but have to admit- your instructions are a lot easier to understand- especially with the pictures of what each step looks like! 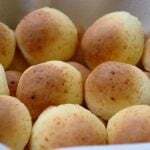 I absolutely love the food here and normally just eat Ecuadorian out where I know it’s good (I haven’t been too successful in making it at home). However, now I’ve been inspired to try again to learn how to make those things that I love so much. I’ve lots of friends who grew up here who are now in the States who will be delighted to discover how they can do these recipes there. Thanks for such a great site! I. Love. This! I like the flower photo, too. 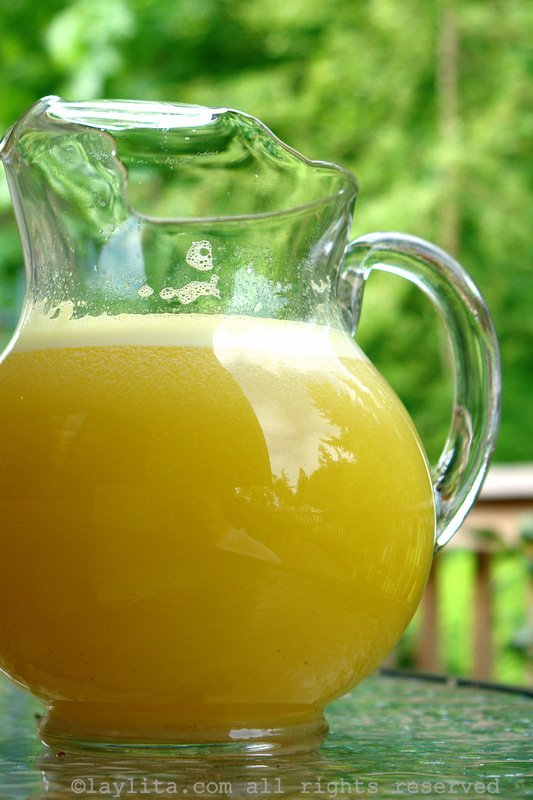 Homemade juices are simply the best. We’ve been lucky to get passionfruit that we’ve been making juice out of right now. Love the chica de pina, too. Can’t wait to try the adult version. Cachaca is the next purchase for our bar stock, is there any brands you recommend that you like? Thanks. Great photos as always. I love passion fruits, I just made sorbet and a yummy mousse with them! On a post for a pineapple caipirinha one of my readers recommended Mae De Ouro and Cachaca 51 (he also recommended avoiding Pitu), I’ve tried both Mae de Ouro and 51 and like them, 51 is the easiest to find; I also recently found one that is called Leblon – I haven’t tried it yet, still have 1/2 bottle of 51 to finish. Even when the pineapples are particularly good, I never think to make juice from them. Thanks for the reminder that sometimes the simple things are best. 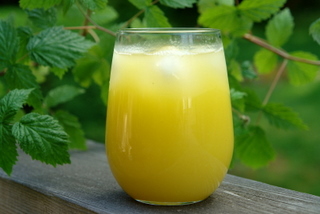 I find pineapple juice (home made of course) to be the best and most refreshing. I also like the drink we make (like yours) with the skin and spices. Fresh homemade fruit [and vegetables] juices are the best indeed. 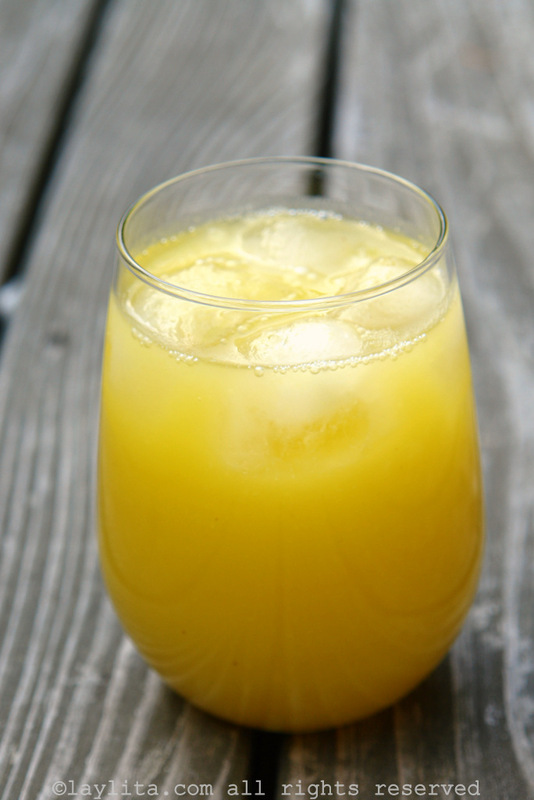 Fresh pineapple juice is wonderful and so easy to make. 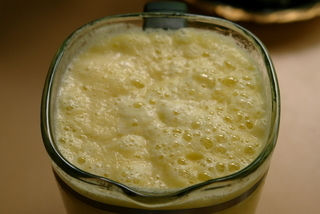 Have you ever tried juicing a pineapple [you can juice the core too]? I have juiced it a few times, but prefer to blender it in the blender. I sometimes save the skin and use it to make a Caribbean inspired drink. 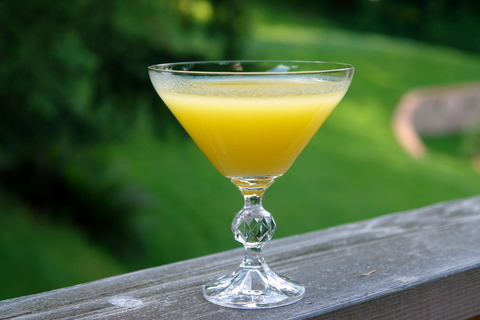 Would love to see a post and recipe of the spiced pineapple drink – chicha de piña – that you mentioned. Thanks! So delicious and refreshing. One of my favorite drinks in Ecuador! What a great drink that I would enjoy. Love the pics. Very refreshing drink indeed… Spring does`nt seem to be coming, we had snow in our area on Monday. 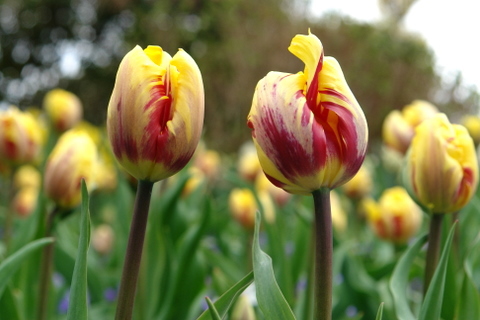 Are the tulips from skagit valley? Sorry to hear that, even here I wouldn’t be surprised if it snowed again before the end of April (I’m hoping it won’t). Yes, the tulips are from Mt. Vernon, the kids were on Spring Break this week so we took a little trip to see all the lovely tulips.